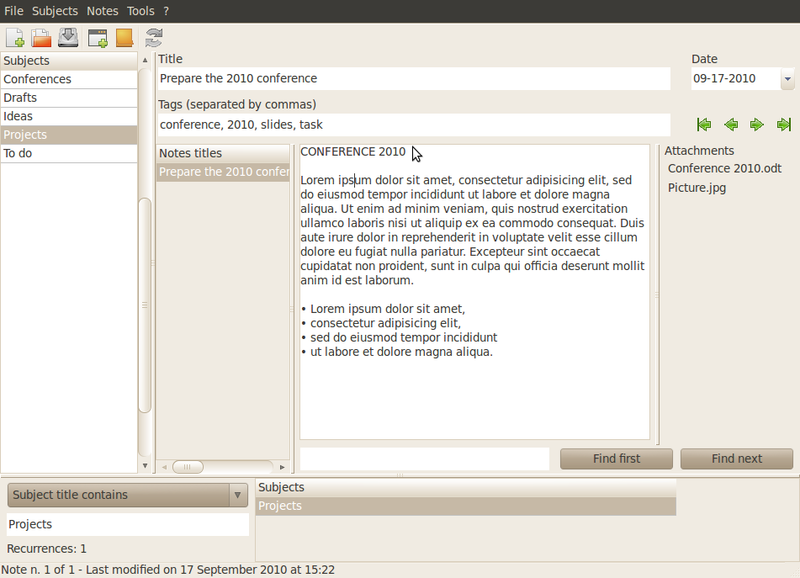 MyNotex is a free software for Linux useful to take and to manage textual notes, also a large number of them. Notes are gathered under different subjects and are made by a title, a date, a tags (keywords) list and a free-length plain text; up to the present version of MyNotex, this cannot be formatted (no italic, bold, etc. ), but the software can manage bullets and numbered lists, although without automatic indentation. A single file of MyNotex contains various subjects and notes. * export data in HTML format, which can be easily opened with a word processor like OpenOffice Writer. download .deb packages from here once you have deb packages you can install them by double clicking on it. Would be nice to see how it compares with Zim. @Jason, I’ve been looking for Evernote for Linux for the longest time. Thanks for the heads-up. The print process is controlled by a process called lpd. bin. By this access, it is often trivial to gain root access. arbitrary code on a properly configured print server. The problems being exploited here are four-fold. •LPD allows you to send as many data files to the printer spooler directory as you want. These files can be binaries, text, or otherwise. •LPD allows you to specify an argument to /usr/sbin/sendmail and execute it. completed (‘M’ in the cf file). However, the sendmail argument in the LPD c.f. On my MyNotex the accent letters are duplicated. Like éé, ãã, etc. I have to erase manualy. How can I fix that?